The title and subject of this book made me anxious to read it. 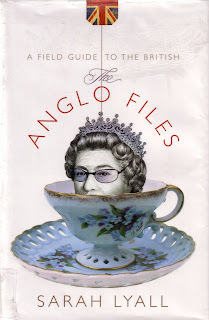 I knew it was written by an American who had been living in Britain for a while, and so I was anxious to read The Anglo Files by Sarah Lyall. I realize that when moving to another country there will inevitably be some culture shock. What I wasn't prepared for in this book was the constant theme running through it of how outdated/ridiculous/backward the British were in absolutely every aspect of modern day life. There are frequent laments along the lines of how "this would never be tolerated for a second in America" and how much superior in every way the U.S. is when compared to Britain. I don't doubt that this is true in some cases, but what puzzles me is why the author continues to live in such a clearly horrible place for a second longer. One would have thought she would have been on the first boat/plane/dirigible back across the Atlantic long ago. The book is divided into chapters, each addressing a particular topic and how the British tend to deal miserably with it. Some examples: blatant sexism is tolerated in government; newspapers don't even try to publish the truth; everyone is drunk all the time; people care more for hedgehogs than children or the elderly; the state of dentistry is a disaster (with NHS dentists often just pulling out all the teeth in healthy patients so they won't have to deal with problems later); the service industry is full of surly, uncaring workers; washing machines are smaller, slower and more expensive than their American counterparts; things are stolen more often than not in the Royal Mail; the weather is terrible all the time; and people "enjoy an excuse for a grumble." Even national heroes can't measure up. American heroes tend to overcome adversity and survive, while British heroes die due to poor planning and "failure to pack the right gear." Every chapter is a rant against something in British society, and no opportunity is missed to point out how much better everything is in the U.S. The worst sin of all (from what I can gather) is that for some unexplained reason, the British do not rinse the suds off their dishes when they wash them. Horrors! This book was a disappointment for me, simply because it came off as an extended whine. I'm sure the author felt better after writing it, but I certainly felt worse after reading it. Lisa- I saw this book online awhile ago and gave it a miss because it got mixed reviews. Now I am intrigued. You are right on with the culture shock thing. I was very young and immature so I did a lot of comparing Britain to the U.S. and whined about the lack of conveniences. I would be interested to know how old the author was when she had these experiences. Maturity and wisdom makes those things I complained about seem so petty now. It's a pity the book takes on such an ethnocentric tone. I have to agree with you. I liked Kate Fox's book much better. Seems to be a big trend at the moment for expats to write nasty accounts of life in Britain - there's a version by a Russian woman doing the rounds. Of course a lot of it is true, but they don't mention the positive aspects. Gail, you are so right! The lady has lived in Britain for a while, and still lives there, so there must be some good things . . . I just would be hard pressed to name any of them after reading this book! I wonder if there are any books that go the other way -- British people who have moved to the US and found it woefully lacking?? It would be interesting to read one of those! Wendy, thanks for the recommendation! I'll look up Kate Fox's book. Melissa, the lady who wrote the book (from her photo on the book cover) looks to be in her late 30s-early 40s. From what I can tell, she still lives there. Maybe if she writes a follow up in a decade or two she might have mellowed a bit! If you do read it, I'd be interested to see if you can "identify" with any of the experiences you had while living over there! Lisa, I had been wanting to buy this book but have heard other reviews that agree with yours. now I'm waiting until someone I know buys it, so I can borrow it.